After spending all that time, money and effort delivering a crew of astronauts millions of miles through space to some distant celestial body, do we really expect them to trundle around like a pack of schmucks once they get there? Not a chance. That's why NASA's next explorers will roll deep in the Space Exploration Vehicle. NASA has employed manned rovers since the Apollo era, when astronauts traversed the moon nearly 20 times in the Lunar Rover. Even after the end of the Apollo missions, NASA continued to develop both manned concepts—like the Lunar Electric Rover (LER) and Small Pressurized Rover (SPR)—and unmanned ROVs, such as the Mars Rovers. 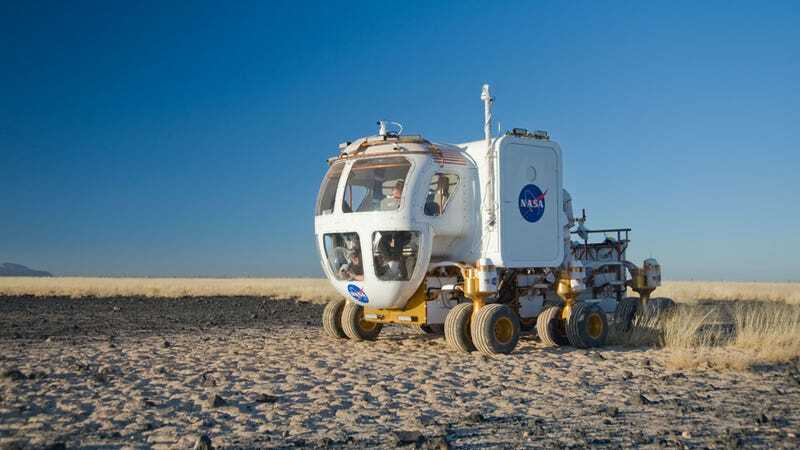 The multi-mission Space Exploration Vehicle (SEV), NASA's latest iteration which debuted in 2007, draws on this large repository of experience. The SEV is a pickup-truck-sized, two-part space/landing craft measuring nearly 15 feet long by 10 feet tall and weighing 6,600 pounds. Its cabin section can be used either as an independent spacecraft for orbital missions like fixing satellites or assembling telescopes, or it can be dropped to the planet's surface along with its Chariot chassis for land-based exploration. The cabin is designed to support a pair of astronauts for up to a fortnight, though it can accommodate a crew of four in an emergency. And since the cabin is pressurized, its passengers won't need to wear restrictive spacesuits when operating it. For space-based missions, a pair of manipulator arms mounted on the nose of the cabin will allow crews to effectively grapple satellites. The primary mission of the SEV, however, is exploration. In addition to being pressurized, the SEV includes an airlock and spaceport for crews to quickly enter and exit the craft. This allows astronauts to break up the normal 4-8 hour spacewalking marathon into multiple, shorter excursions with bathroom breaks in between. The Chariot section, on the other hand, is a 12-wheel omni-directional chassis with a top speed of 10 kph designed to require minimal maintenance over its 10-year service life. It's powered by a plug-in Lithium-ion battery with a 125 W-hr/Kg specific energy (NASA's still working on the 200 W-hr/Kg power source the flight module needs). What's really cool is that the chassis doesn't need the cabin to be driven. That is, an astronaut in a spacesuit can drive the chassis like, well, a chariot. This comes in handy when using it as a cargo transport—it can tote up to 2,200 pounds of gear. The platform is not only capable of turning on a dime, climbing a 40 degree slope, and driving in any direction, it can also kneel—granting the crew a closer look at the ground in front of them—and crab walk sideways to avoid obstacles it cannot overcome. Plus, the chassis can accommodate cranes, backhoes, bulldozer blades, and other tools, depending on the mission requirements—perfect for building Newt Gingrich's lunar laser base.